Organizations eligible for awards up to $2,000! The Minnesota Community Broadband Awards recognize communities that have successfully implemented strategies that improve the deployment and use of broadband. Awards will be announced at the Connected Communities: Making the Net Work for Minnesota conference in Eden Prairie. Broadband Infrastructure and Services; recognizing the provision of high speed broadband capacity and services to a community, area or region. Broadband Market and Application Development; recognizing efforts to stimulate community demand for broadband services and/or to deploy advanced broadband applications in business, education, government and healthcare. Go to http://www.blandinfoundation.org/BBConf08/application.html and complete the four question application. National Rural Economic Developers Association (NREDA) annual conference is scheduled for Nov. 9-11 in Kansas City. Theme of NREDA’s 20th Anniversary event is, “Celebrating What’s Right With Rural America.” We have a fantastic program lined up and we’d like to extend an invitation to you to join us. Non-member first-time attendees may register at the member rate…how cool is that! Minnesota Rural Partners is evolving again. We are becoming a virtual organization, still a non-profit, run by volunteers. We will continue writing this newsletter. 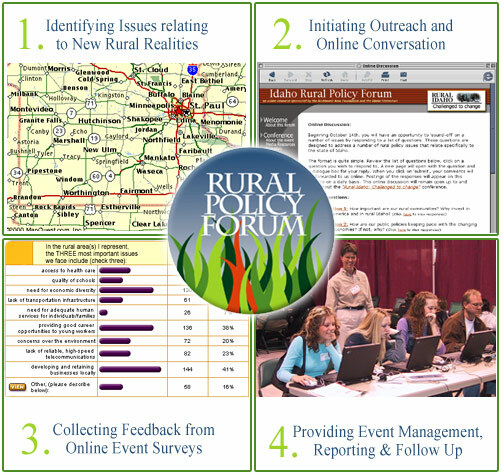 This week we will turn our website into an interactive blog, providing a connecting and clearinghouse function for events, resources, news, and ideas on community, economic and rural development across the rural-urban spectrum. We will continue to share our survey and registration online tools with other non-profit organizations. MRP has worked for nearly a decade to create tools that connect people with resources for community and economic development, including bizpathways.org and the Minnesota Entrepreneurial Gateway. We’ve tried to find them good homes here in Minnesota, but to no avail. Those tools will be on hiatus while we gather fresh insights and ideas. Their time will come again. Jane Leonard, MRP’s president, who has been on leave to run the Minnesota Sesquicentennial Commission until January 2009, will continue to write for the blog and network for MRP. Denise Pfeifer, acting director, will continue helping with ongoing responsibilities until she heads to Kansas this summer. Deb Miller-Slipek will continue to gather all the great tips on funding, training, and resources, for the newsletter and blog. Ann Treacy, our webmaster, will continue to support the blog and other online tools. Jane will be contributing to the MRP blog as our “foreign correspondent” writing dispatches from Australia, between February and May 2009, where she will be on a study sabbatical. The last time Jane was in Australia was in the late 1990s when she was representing the State of Minnesota as a partner in the United Nations Trade Point project, an international, secure electronic commerce gateway. In 2009, she will be researching Australian community technology applications, and entrepreneurial and enterprise development. She will continue work on the community economic reinvention framework that she and others at MRP started (the initial work was funded by a W.K.Kellogg Foundation grant four years ago). The framework idea is a major reason why Jane is heading to Australia, to see how colleagues there are organizing community-based environments that support entrepreneurship and enterprise development — comprehensively tied together on regional, state and national levels.